When Chris Montero decided to become a professional chef at the ripe old age of forty, he had the distinct advantage of being descended from generations of gifted New Orleans Creole home cooks plus some youthful training under a few grand old New Orleans culinary giants. His entire 'mature career' has been with Ralph Brennan, starting with over a decade at BACCO. He went on to serve as executive chef of the relaxed and congenial cafe b in Metairie, where he took the familiar to a whole new level of goodness, by creating his own refined interpretations of homey comfort foods and New Orleans favorites. 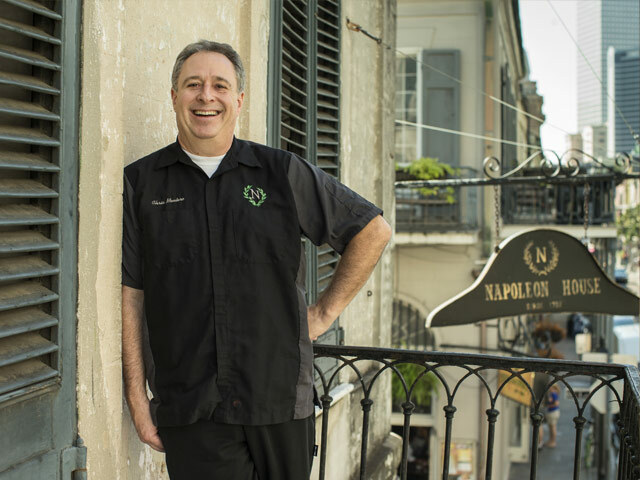 Today, he is proud to be Ralph Brennan's first chef at the helm of the Napoleon House kitchen, following the spring 2015 transition of ownership from the family that had maintained the beloved New Orleans landmark for over 100 years. With his own centuries-deep roots in New Orleans cuisine, Montero is right at home preserving the distinctive menu of Napoleon House, long dominated by an "Italian grocery" sensibility, while bringing the ingredients in line with the Ralph Brennan Restaurant Group's insistence on fresh and local sourcing. Montero also oversees Ralph Brennan's cafe NOMA in the New Orleans Museum of Art, where, in the bright and stylish cafe, bar, and lounge, arts patrons can extend their rarified sensory experience to the refreshments.